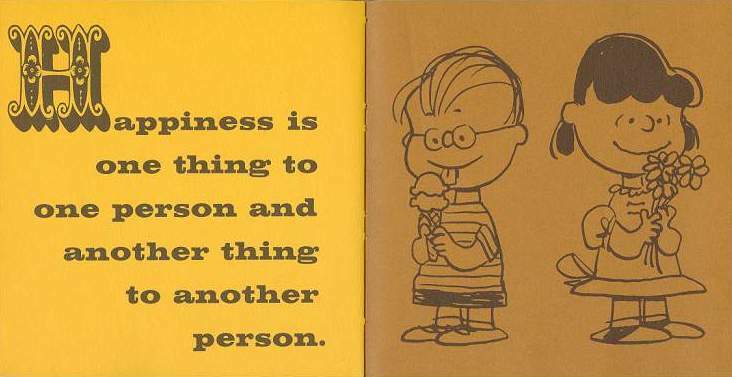 When we were very young, Charles Schulz was very much the epitome of truth-sayer: he had grasped all the important bits of being six, summed them up in very few words and then illustrated the profound with the relatable. In our mind, he knew very well what he was talking about because he had given Linus glasses (we shared his pain) and had concluded that there was not much that was better than ice cream. The Peanuts Gang had its trials and tribulations but on the whole they lived in a universe where having 18 different colours in a box of crayolas was very close to being in heaven. Today Across the Bored wonders whether our capacity to be content has become tainted; not the “that’s nice, we’re feeling pleased, so happy to see you” range of emotion but rather that all-encompassing warm and fuzzy, push all other thought out of our heads feeling that happens less often as time goes by. Over-satiated by information and input, overwhelmed by emotion, experience and the seemingly endless drama of living life often at full-tilt for too long, simple joys appear to be hard won. Is it that we are too full of too much or is it just a 21st century version of the grass being infinitely greener on a larger monitor? Some of us have to work longer at it than others, some make a life’s work of making others happy, there are a few who seem to float smiling along in their own rapturous bubble, lucky them. Perhaps we are looking too hard or in the wrong place and, like they say of love, should stop looking for it altogether and let it come to us unbidden. The Two Cents Tuesday Challenge theme this fortnight suggests that – Bliss – is much like treasure, find it where you may. I have to say that, although I already entered my seductive bliss poem, it’s the little things that “send me”–I’m blessed to be easily thrilled: finding that the potstickers were still on sale so I could buy 2 bags! Maybe that’s not bliss by many folks’ definition, but I felt greatly satisfied, a tremendous sense of well being that God Himself had granted me favor….and I ate far too many potstickers that night, but it was a wonderful discomfort! Very true how it’s the little things that tide us over… Thank goodness!